As 2017 comes to an end, BEAM really appreciates the moments we spend with our students before another year begins. Each year, we invite all BEAM alumni to a Winter/Holiday party where students get to mix and mingle, listen to music, play board games, take pictures and enjoy some food. This year we made our party an Ugly Sweater Party with a competition judged by BEAM students. Take a look at the Ugliest sweaters you can imagine! 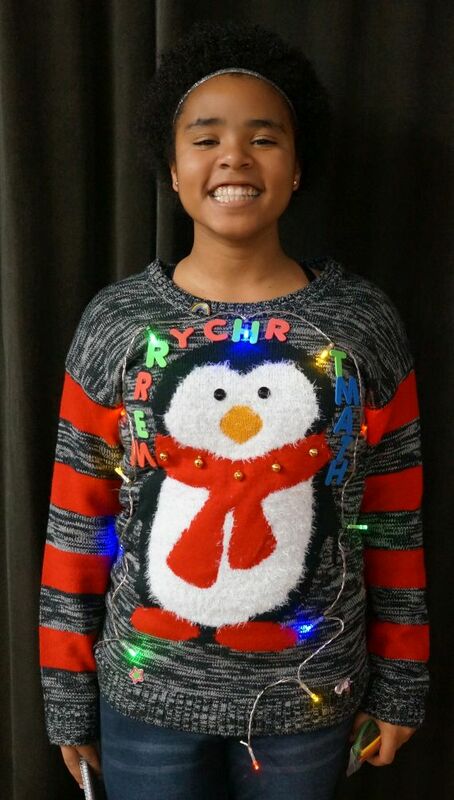 Semi-finalists for the Ugly Sweater Competition were: Luz, Elijah, Michelle, Mariam, Deja, Vielka and Thays. The top three finalists were: Michelle, Mariam and Thays. And the winner was: Thays -- with her "Merry Chris-MATH" sweater! All students took home BEAM swag as prizes. In addition to the Ugly Sweater segment of our party, students played games like: Set, Dominion, Settlers of Catan, Swish and Uno. They also took a stab at solving some logic and math puzzles and received cool BEAM swag if they solved them. Students took fun holiday pictures at the photo booth and enjoyed some yummy Chinese food. Overall, it was a great afternoon spent with some awesome teenagers! Check out some great moments below! Each year, we invite all BEAM alumni and staff back together for a winter party of board games, pizza, music, and time together. It's so nice to have our BEAM family back in the same place, spending time together. This year, as a fun extra treat, we also set up a photo booth for alumni and staff. Check out all the portraits we captured! From all the BEAM staff, we wish you a happy holiday season and a happy new year! With all of our important academic events, it's great to also make time for BEAM students to come together and just hang out! Every December and June, BEAM hosts a party for students in grades 8-12 to get together with their friends, eat, and play games.